We offer a combined pregnancy & newborn portrait photography package for the discounted rate of $1150 for the two sessions. Your newborn baby is so small and perfect, you’ll be amazed at how quickly s/he will grow and develop into a little child, seemingly overnight. You’ll want to capture this wonderful moment to look back on. We make this very easy by coming to your home, where you and your adorable baby are most comfortable. 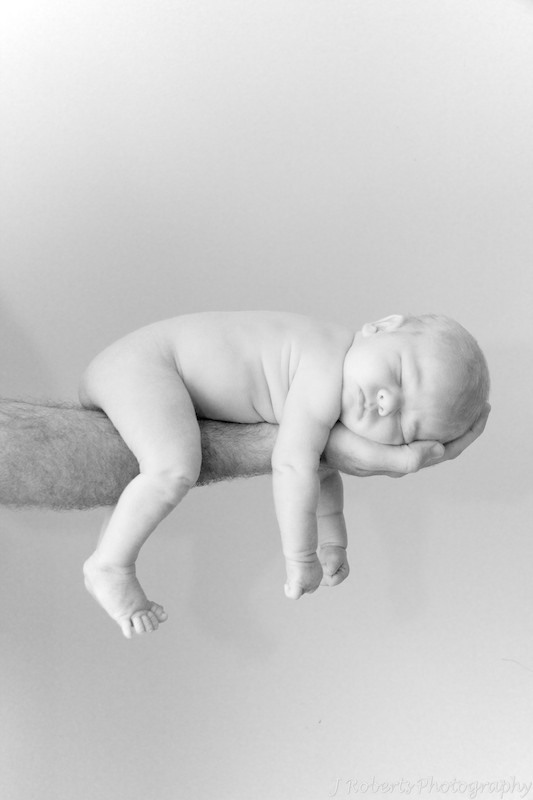 No need to get yourself organised to head out of the house (as parents we know how difficult that can be with a newborn) and head to a studio, where you and your baby might not relax easily. Whether in the comfort of your own home or your chosen location, we will capture the essence of your newborn in photography, awake, asleep, in your arms, with siblings, alone, with the whole family…. Have a look at our Newborn Baby Portrait Photography blog to see our latest work. To capture portraits of your baby, with baby photography, in the true ‘newborn stage’ where your baby is so small, precious, relaxed, and floppy, we recommend you make your appointment within the first week. However, don’t panic if you aren’t able to arrange this up to 3 months we can photograph in the newborn portrait style, after that age, we focus more on a family portrait photography style of shooting. Get in touch and let us know when you are due, and we'll pencil you in the diary so we know we have availablility. Then after the baby arrives let us know and we'll book your appointment. We generally block out the morning or afternoon on your chosen day, then work around what time suits you best, we can even leave it until the day itself and call when you know what time will suit. We know newborns are unpredictable! It’s important for you that it’s as easy as possible. We style the newborn portrait photography session with the photographer looking through the lens and also making your baby relaxed and comfortable different poses in the optimum light within you home. The newborn portrait photography shoot will take approximately one to two hours from which you will receive a USB of 70 – 100 fully edited high resolution images, all in colour and Black & White. So when you fall in love with ALL the photos, you won't go through that painful decision process of what to miss out in your ordering! In addition we will put together a slideshow ready to show family and friends on your laptop or iPad. Why not combine this package with a pregnancy portrait photography shoot to complete the memory of this time of your lives. We offer a combined portrait photography package for $1150 including the two sessions as a complete package. Everyone has been so generous with gifts for you and your baby; you want to say a very special thank you while introducing your little one to them. We can produce stylish photographic cards with the photos from your portrait shoot as a thank you card. Follow the link for details. Use the photos from your portrait shoot for your 'Thank You' cards from just $2.75 each.